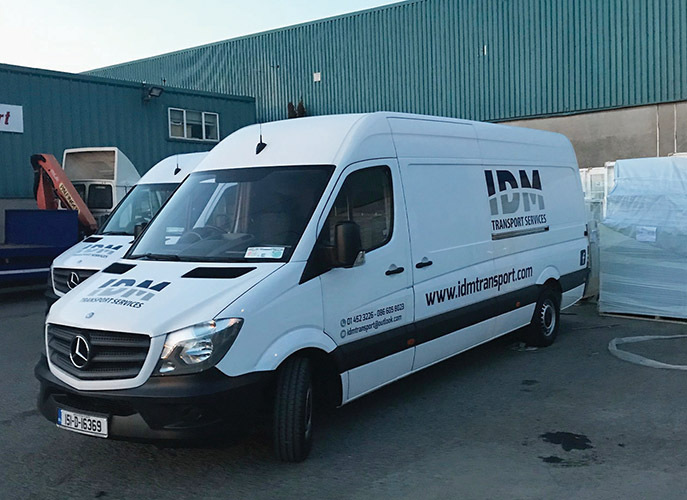 With a mixed fleet of 30 vehicles on the road, standard-setting groupage and courier specialist IDM Transport Services has gone from strength to strength since its inception in 2012. Irish Trucker visited their Tallaght base and caught up with director Dave McKee to gain an insight into this exceptional family-run operation. IDM’s biggest contrast is with Primeline Logistics, although they also work for a veritable who’s who of logistics companies and freight forwarders across Leinster and beyond, including Ace Express Freight, C&C Logistics, PRL/Britvic Quality Freight and Cargo Link UK. Providing versatile, efficient and reliable general haulage solutions, the fleet at present comprises some 30 vehicles – six tractor units, 20 rigids and four vans. It’s a mixed fleet, with Dave and Isaac happy to purchase the best available truck or van each time, regardless of make or model. “We’ve found Mercedes Sprinters to be very reliable and we also have quite a few DAFs in the fleet at the moment,” Dave notes. “The tractor units are MANs and we’ve also recently purchased a couple of fresh, second-hand Scanias in the UK at the right price. It’s all about putting quality vehicles on the road at the end of the day and you can still get a good deal in the UK even after the high cost of importing them is factored in. “That’s the route we decided to take from the beginning. We find value in buying from the UK and bringing them over and the result is that we now own most of our vehicles. About 80% of the fleet is owned and 20% is leased. We’ve had to budget to get there but we have managed to do so while keeping very high quality vehicles on the road as well. All the vehicles are kept in immaculate condition and optimal running order at all times. “We have our own maintenance team here and we try to do most of the work ourselves, including the 13-week inspections,” Dave adds. Considering that IDM Transport Services has evolved to the stage where it holds many key contracts, is regarded as a market-leading freight / groupage service provider, and generates direct employment for a team of 34, Dave must be proud of the progress the company has made in a relatively short space of time? Looking to the future, Dave feels that further growth is possible but it’s not necessarily something that IDM will be chasing: “Our goal is to continue to provide a good service,” he states. “By doing that, we should be able to grow within reason. But we certainly don’t want to outpace ourselves. There’s enough stress in this line of work without that. A third McKee brother, Sam, is part of the driving team and – as a family business – the directors go out of their way to deal directly with customers and afford a friendly, personal service. “We’re very much hands-on,” Dave confirms. “I’ve been off the road myself for the past two years, although I still do a little bit of driving from time to time to cover for holidays, etc. The phone was ringing constantly and you just can’t run a business of this size from behind the wheel.